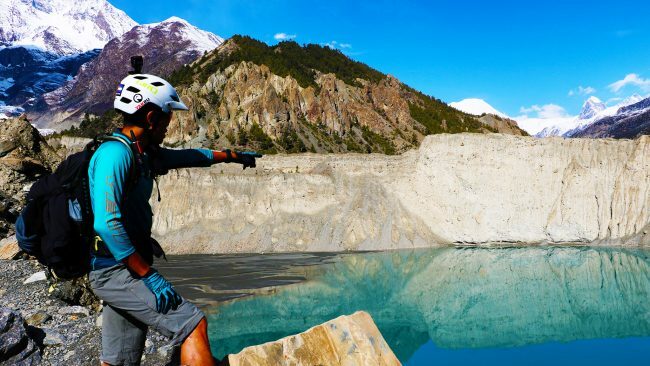 Embark on an incredible adventure on the roof of the world exploring the Annapurna Range’s best trails with Dawn Till Dusk & RAW Epics, renowned bespoke guided MTB trip providers of Asia! This is an all-inclusive 15-day trip with 9 full days of Himalayan singletrack riding, and visits the same terrain and trails (and more!) as the Yak Ru Enduro, the world’s highest MTB enduro race! We cover everything you need: food and accommodation; all land transport & airport transfers; certified WFR and high-altitude trained safety crews; and our experienced, friendly, professional, English-speaking guides & logistics specialists. A mind-blowing riding and cultural experience awaits you: come with us as we show you some of the best big-mountain enduro style trails you can handle on your bike – in an awe-inspiring alpine landscape steeped in history, spirituality, and natural beauty. – All land transport from arrival until departure, including airport/accommodation transfers; and logistics between Kathmandu & tour locations. – Plenty of chances for wildlife sightings, including blue sheep, vultures, Himalayan eagles, and possibly the elusive snow leopard! 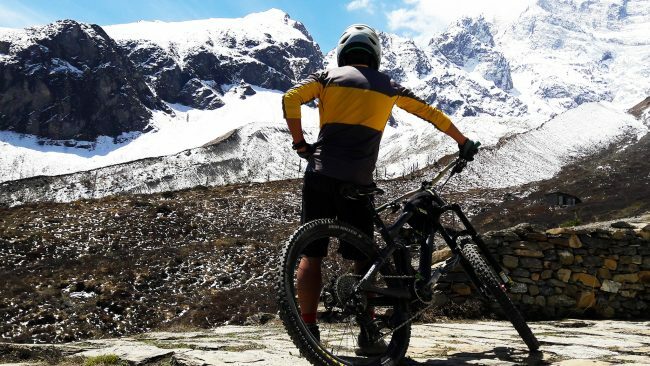 Welcome to the Manang District of Annapurna Ranges, Nepal – where the best of the best mountain bike trails are right here! Our tour commences when we pick you up from Kathmandu Airport (Tribhuvan International Airport), and concludes when we drop you off at the same airport. Arrive at Kathmandu Airport; transfer to Kathmandu accommodation. Dining options dependent on your time of arrival. We’re up early to catch our transfer from busy Kathmandu to the town of Besishahar, and then onward to the village of Jagat where we’ll spend the night. The drive is scenic, rugged, and awe-inspiring – with several photo-taking spots along the way. As we progress, our guides will share with you essential info about the history, culture, and geography of the area. The ascent to the high country progresses. We’ll stop for lunch along the way at Timang, then continue past an Apple farmhouse in Bhratang to stop for the night at Dhukkur Pokhari. We will make this alpine outpost our camp for the night and further acclimatize. For those who would like to hike and stretch their legs, now would be a good opportunity. Bike is fitted in this village and test ridden. After and early morning breakfast, we will start our ride the legendary village of Manang – via the mountain access track – to Manang, our base for the next several days. This essential, steady-paced acclimatization ride sets the stage for the rest of the riding on this trip – which will be more gravity-oriented. Along the way, take in the views of the vast mountains rising up on both sides of the valley. The first true downhill of the trip takes place high above Gangapurna glacial lake. A morning ascent to the high Chorten (religious monument) at 4000m altitude takes us to the start. The first part of the descent is rich with route options down scattered rock gardens and singletrack, before opening up to an alpine pasture where you may find horses or buffalo grazing. Stop for a relaxed mid-morning tea break at the mid-descent teahouse before continuing on the trail with a different flavour: loose switchbacks and steep traverses overlooking a magnificent scree slope. After lunch, it’s uphill again to visit the Chorten directly above Manang town, followed by a scenic descent back to street level to cap off our first full day of riding. Stock up your supplies for a big day out! We shuttle up to the nearby town of Khangsar, where we then ride/hike higher up to Shree Kharka and beyond to 4300m altitude. A wild, descending traverse is the reward, taking us through a remote, abandoned village and into the neighboring valley. A connecting ascent puts us above the hamlet of Gunsang and on the main route back to Manang – a trail shared with tourist hikers and locals with their livestock. Visiting the sacred cave of Milarepa is the highlight for today. We ride out of Manang, crossing a farm before coming to the big climb of the morning. The reward: outstanding views of Milarepa monastery, standing before an immense glacier beneath the peak of Annapurna III. The only thing that beats the scenery is the exciting descent that awaits: steep, loose, and fun along beautiful ridgelines, pine forests, and scree slopes. We then take an easy ride back to Manang via an alternative route. From Manang short descent towards Braga, followed by a short ascent, sees us taking in more side trails on the Julu plateau. This spot boasts unique cross-country style alpine trails punctuated by some rowdy descents. With myriad trail options to choose from, including a picturesque lake to explore, a full day of riding is guaranteed. Traverse back to Ngawal (a resort where we will be based out of for the next 2 days) where a sumptuous dinner and relaxing drinks by the fireplace beckon. Setting off from Ngawal, we work through the trail system sitting just below the town, making multiple shuttle runs as we sample different descents and work on our technique through some truly unique terrain. Loose corners, rocks, stream crossings, and wonderful pine forest singletrack all combine for a great day out unlike any you have experienced so far. Return to Ngawal for the evening, and to prepare for the next day ahead. 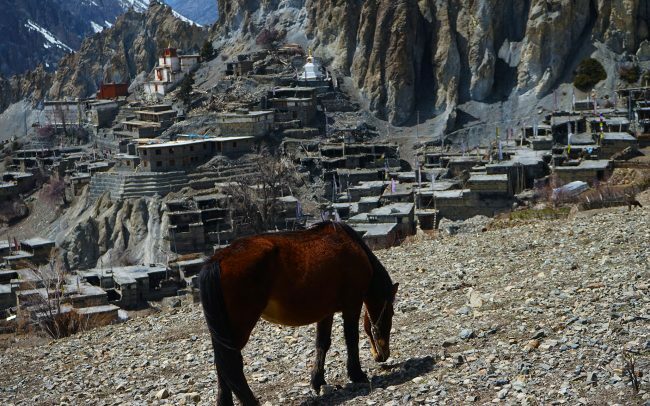 Our traverse takes us along the mountainside trails overlooking the Manang valley, passing through the namesake village of Ghyaru, from which our event Yak Ru derives its name. A rest stop here is essential before we explore the big descent east of the village. This is a trail seldom visited by MTB riders, and we’ll be among the first to be dropping into it as we regain the trail to Upper Pisang. Gentler, more picturesque singletrack awaits us upon our return to the valley, easing us into the tail end of the day where rest and recuperation is the order of the evening at the district HQ at Chame. A massive day of descending is ahead of us: over 40km and 2000m of elevation loss to reach Tal! Along the way, we ‘ll stop for brunch at the apple orchard/resort at Bhratang – the country’s largest – and sample fresh apple products, including cider and apple brandy. The route downhill is an exciting mix of rock gardens and steep cliff exposure, punctuated by stream crossings and waterfalls. The village of Jagat is the welcome overnight rest-stop that concludes the penultimate & longest day of riding. We pack up the bikes here in Jagat and load up the vehicles before making our way out of the high country. We’ll pass Besishahar once more before our final leg back to Kathmandu. Upon arrival, settle back into the urban life – you and your equipment will be transferred to your accommodation for a good night’s rest. A free and easy day where you are free to roam around (more souvenir hunting) or just settle in and relax after the days of adventure in the mountains. A farewell celebratory dinner is scheduled to bring our journey to a fitting close. Here is where our Yak Ru program ends. Extend your stay in Kathmandu/Nepal from this day onward, or catch our transfers back to Kathmandu Airport (Tribhuvan International Airport) for flights out of the country.